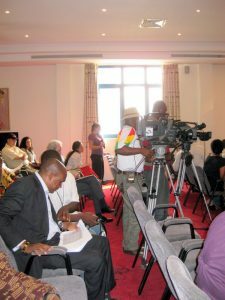 It was December 28 that the entire team of The Nation Report brought coverage of the 2008 highly contested presidential election run-off in Ghana. Our team expected election violence following election violence in Kenya in 2007 and in Zimbabwe in March of 2008. That year Mauritania underwent a military coup, and Guinea did as well on December 23 just a few days before the run-off. This being our first time reporting from western Africa, we witnessed a population striving to achieve a forward progression toward democracy, and fair and equal representation. We spoke to voters who said that they were tired of corruption, yet still held out hope that their vote would mean a brighter future for themselves and their children. This was evident in voter turnout which was over 72%. 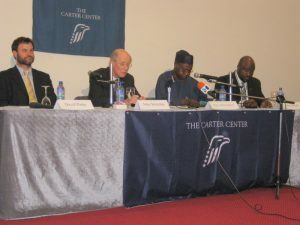 The Carter Center deemed the elections free and fair, but election observers pulled us aside at the Carter Center press briefing to tell us that they disagreed with that assessment. 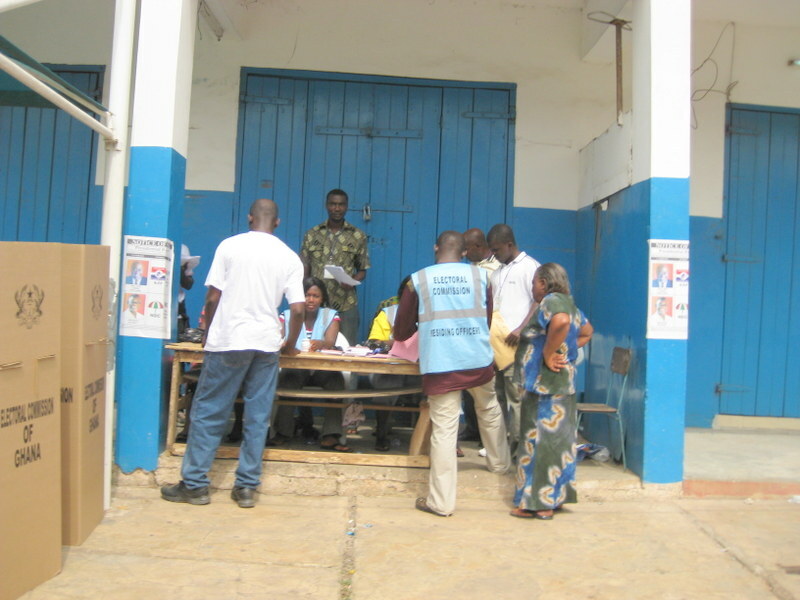 Observers witnessed ballot box stuffing, physical threats to voters, and ballot box theft. Indeed in one village in the north of the country, an observer witnessed someone grabbing an entire ballot box and fleeing on a motorcycle with everybody’s votes. We questioned the Carter Center observers about this, but they denied hearing any such reports. Mirroring the practice in other countries across the globe, the earlier election took place on a Sunday, December 7, with candidates hoping to win more than 50% of the votes. 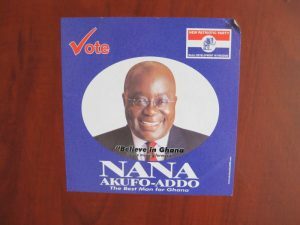 None did, but Nana Akufo-Addo, the New Patriotic Party (NPP) candidate, and John Atta Mills, the National Democratic Congress candidate (NDC), received the most votes forcing a run-off scheduled for December 28. 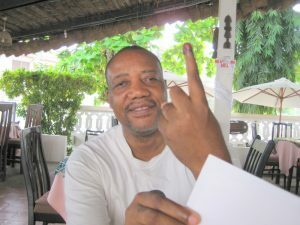 Also mirroring the practice in other countries where we have done election coverage, the purple inked finger was a sign that voters could wear proudly to prove they had voted. Mills was certified as president on January 3, 2009, but only by winning one percent more votes than Akufo-Addo. 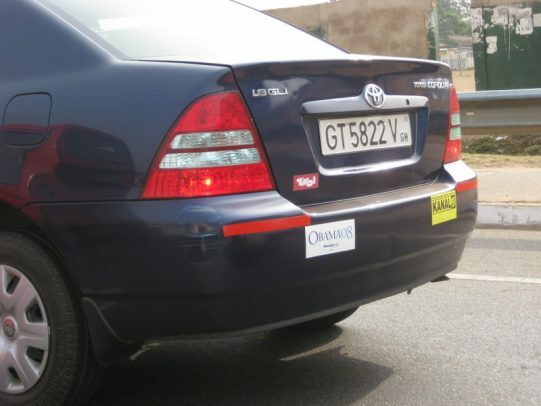 This was the closest election in Ghanaian history. This election goes down as the most exciting we have covered since. The mood, the shutdowns, the street celebrations, the decorations, all showed us that stakes were high and that Ghanaians were engaged. Honduran and Salvadoran elections would probably take a close second and third, but elections we have covered in Indonesia, Colombia, Mexico, and Guatemala struck us as relatively quiet. 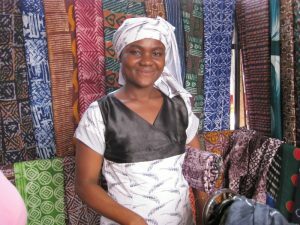 As four women traveling throughout the country and later making our way east to Togo and Benin, we remained less concerned about election violence as we were about violence toward women. We witnessed several instances of physical violence toward women. This impression stuck with us after the election as we moved east to Togo from Accra, Ghana on what we thought was a public bus. 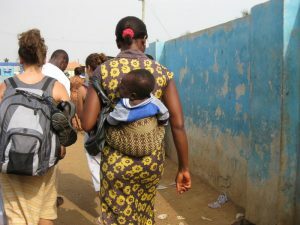 To this day, we’re not sure what happened, but that afternoon we boarded a microbus expecting to be taken to where we could cross the border to Togo. 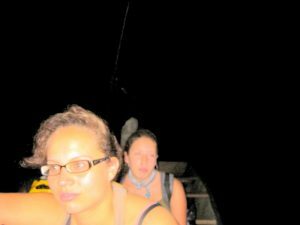 During the trip, as the skies darkened, more and more people exited the bus to the point where the four of us were the only passengers left. The bus continued down the highway, we turned onto a narrower road, turned again onto a dirt road that turned into a narrow path, to the point where we were driving through bushes. Two of us had pepper spray which came out, yet the weapon would have been useless against about ten men who were standing in front of the van when it finally came to a stop and the lights went out. We could see the shadows of the men that showed through the reflection of the moonlight off of a lake directly in front of us. Personally, I felt so frightened and helpless that there was nothing I could do to stop whatever was going to happen. We were carrying a lot of weight in our backpacks, but we were willing to dump it when we decided to run. We didn’t get a chance to run though since the driver came to the back of the bus to tell us that we owed money for them to take us across the lake. We hadn’t prepared to cross a lake, and we didn’t know what was on the other side, but we did understand that he wanted money. Through about ten minutes of communication issues, he agreed to take $80 for a ten minute boat ride across the lake. It was all we had, but were happy to part with it for a chance to land safely on the other side of the lake. I decided to take this picture of the boat ride, because at this point, I thought that if we were going to be killed that I would throw my camera into the lake, and someone might find it someday. Either way, I felt we had nothing to lose at that point. When we landed, a man met us and directed us to follow him. We were still contemplating running, but we were still terrified and not thinking clearly. We decided to follow directions. We did in fact arrive to a safe situation. The man meeting us on the other side of the lake turned out to be a hostel owner who hosted us for the night and helped us get more money despite banks being closed for the election holiday. 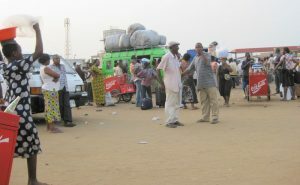 We then hired a driver to take us to through the country and to the Beninese border. 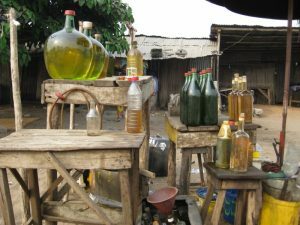 Porto-Novo was lively with entire families riding on one motorcycle and the roadside gas stations that sold a whiskey bottle full of gasoline. 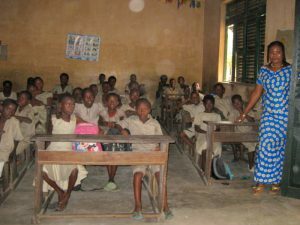 We happened upon a public school in Porto-Novo and most of us, having been teachers, asked for permission to visit. The children were fascinated by lighter skinned people, although we are all dark by other standards. Our thrill was abruptly cut short when we witnessed a teacher slap one of her students across the face. The child seemed undaunted, and the rest of the classroom seemed to have no reaction to the violence. We concluded that the teacher was behaving accordingly to make an impression on us, so we left the school as fast as we could after reporting that teacher to her colleague. 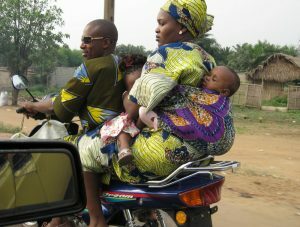 The return bus trip to Accra was similarly eventful. 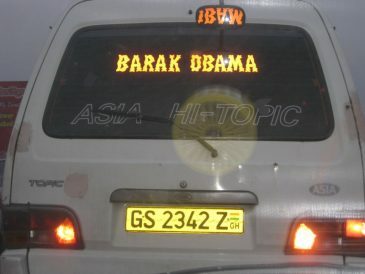 Since public transportation was mostly shut down because of the election, the rare microbus headed for Accra was bombarded by people who climbed in through the windows to get a space. We were lucky to find a passenger bus off the beaten path that displayed “Accra” signage as its destination. We each got seats, but the trip made multiple stops in remote locations and what should have been a two hour trip turned into eight hours. On several of these stops, we were instructed off the bus by the military for a search. We had no idea if what we were carrying was acceptable, but one woman who was transporting cloth was removed from the bus and taken away. We too had purchased several varieties of cloth lengths, but it either wasn’t found, or was of no interest to the military. At one of these many stops, the conductor argued with his assistant, stopped the bus and slapped her across the face. Nobody seemed particularly affected by this. We were shocked into paralysis, and could only garner enough courage to ask her if she was alright at the next stop. She seemed confused by our concern, but thankful nevertheless that we cared. The bus dropped us off in a remote location of Accra, but we made it safely to a hostel and eventually all made it back to the US safely. Akufo-Addo went on to win the Ghanaian 2016 presidential election and is up for reelection in 2020. Although some news outlets feel election coverage doesn’t represent the true state of a country, we see voters and countries in a different space than they are outside of election seasons. To us, that atmosphere is newsworthy.